25% Off ENTIRE Kate Mack Swim Collection! Emme is proudly showing off her Kate Mack one piece swimsuit , Kate Mack cover-up, and Kate Mack flip flops from the cherry collection. This little girl loves to model our clothes! In fact, you will see Emme in our print ads and on line on our site. Thank you Emme and to Haynes photography in Dothan, Alabama for always taking great pictures and making our outfits look so special! Starting today until May 6th our entire Kate Mack swim collection is 25% at www.ShopThatStore.com Just enter the code KATEMACK25 at checkout and enjoy the savings!! Hurry. Sale ends May 6th!! We love this brand! 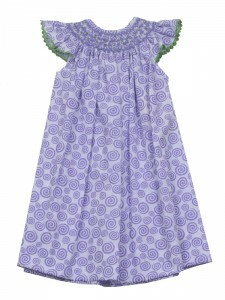 Peaches n Cream has wonderfull casual outfits – short sets, capri sets, and dresses. 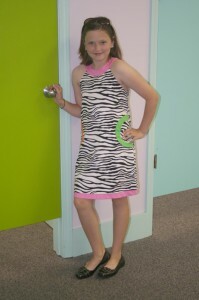 Mary Katherine tried on the zebra dress, and it is perfect for that hard to dress age. She’s 11, and she loved the wild, zebra print. I loved that it had a modest, traditional fit. Peaches also has very reasonable prices that anyone would love! You have until April 27th to take advantage of our Spring Sale. Your entire order is 15% off when you enter code SPRING15 at checkout. Visit www.shopthatstore.com.